We finally branched out from our standard veggie burger and grilled vegetable routine. A delicious routine but still a new routine. Except, I still grilled some vegetables. They were on a skewer, though.. which makes it somewhat different, right? In this case, they were smothered in a jerk-inspired (but not too spicy) spice rub. I also slathered it on top of some extra-firm tofu. I used sweet red peppers and a sweet plantain which contrasted with the spice rub incredibly well along with some zucchini, because zucchini grills so very well. In fact, I dare say the plantain was the highlight of the meal. I picked a very black plantain and figured I had nothing to lose, as I wasn’t sure how it would grill, but it was wonderfully sweet and smoky. The only problem? I cut the pieces a bit too small and they were more fragile than the other vegetables. I think Rob lost a few while grilling. I suspect fresh pineapple would be a fabulous substitute for the plantain. I served this to guests and they raved about it. I hope you like it, too. I am sharing this with Meat Free Mondays, No Waste Challenge and Vegetable Palette for reds. 2. Press your tofu if it isn’t truly extra-firm. Prepare your vegetables by chopping them into bite-size pieces that will still stay on a skewer. 3. In a small bowl, combine all of the spices. Add enough melted oil so that it has thinned enough to be spread onto your vegetables. 4. 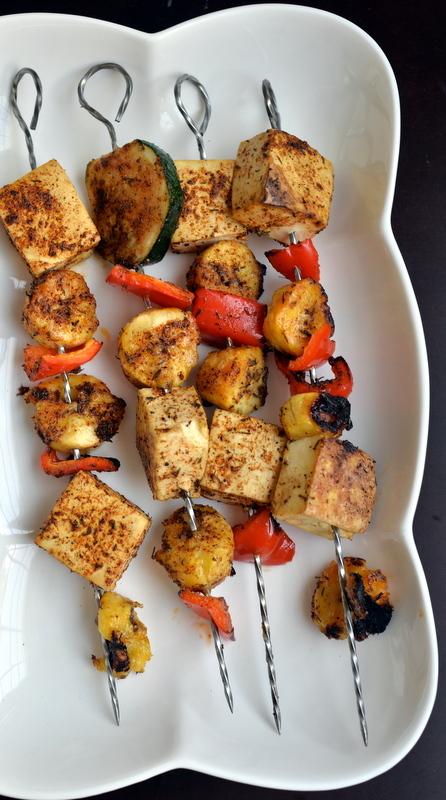 Thread the vegetables onto skewers, alternating different vegetables and tofu squares. Brush the vegetables with the spiced oil rub. 5. Preheat the grill until hot. 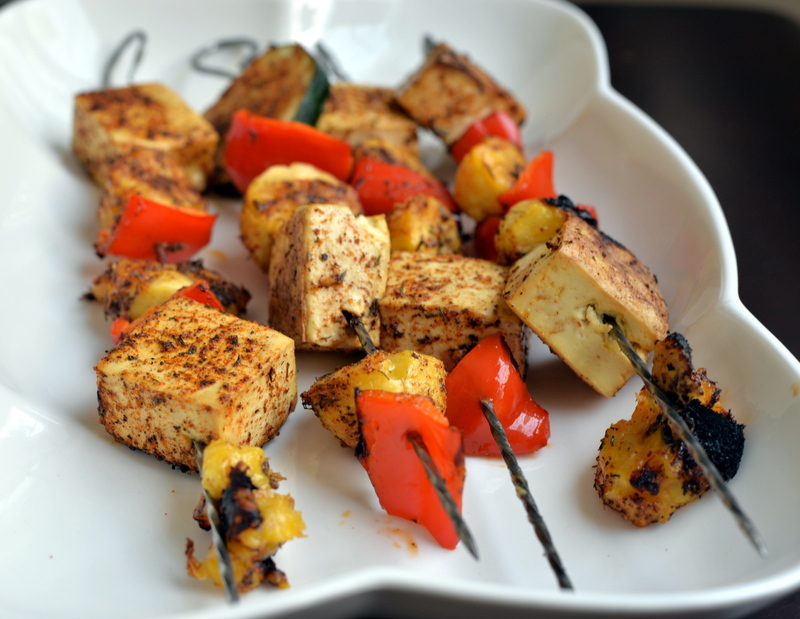 Arrange the skewers on a lightly oiled grill and cook for about 5 minute per side, turning once, or until the vegetables are tender and nicely browned. Serve hot but take care not to burn yourself on the metal skewers. Oh man, this sounds amazing! Definitely 100x better than the typical veg fare at bbqs. I really need to go get my hands on some plantain now! These look really good! I love fruit in savoury recipes and have a gifted tub of Jamaican jerk seasoning in the cupboard that hasn’t even been opened yet. 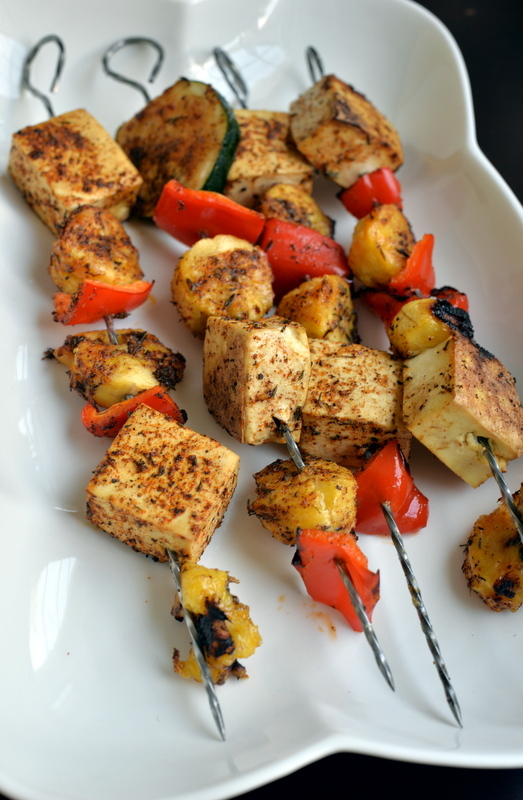 I tried kebabing tofu for the first time recently and baked the skewers, basted, suspended over an oven proof dish. Worked pretty well and nothing got stuck to the pan.